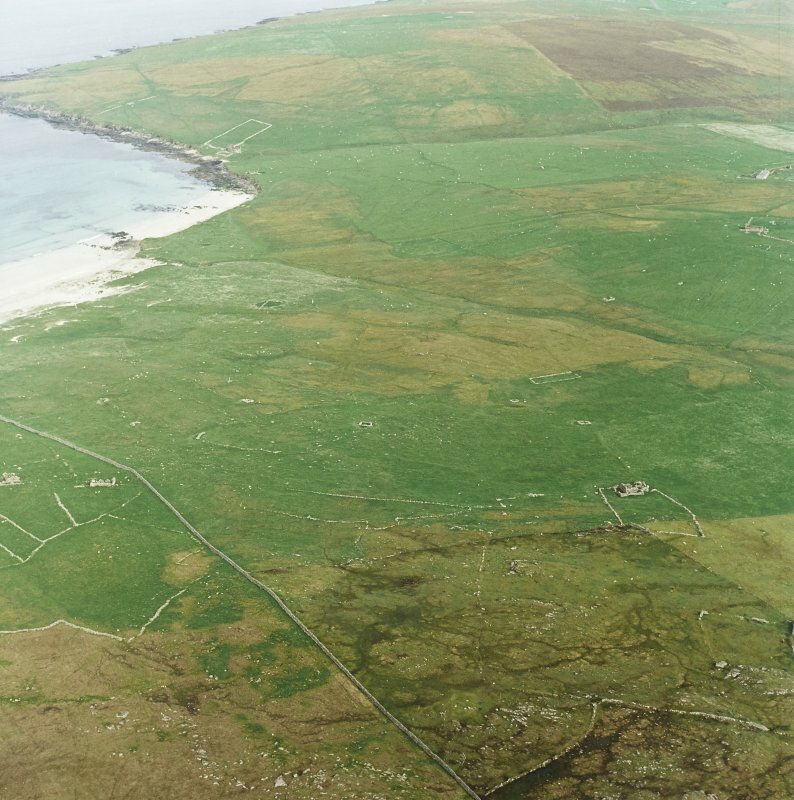 Oblique aerial view centred on the remains of the township and head-dyke, with the remains of the Viking settlement adjacent, taken from the WNW. 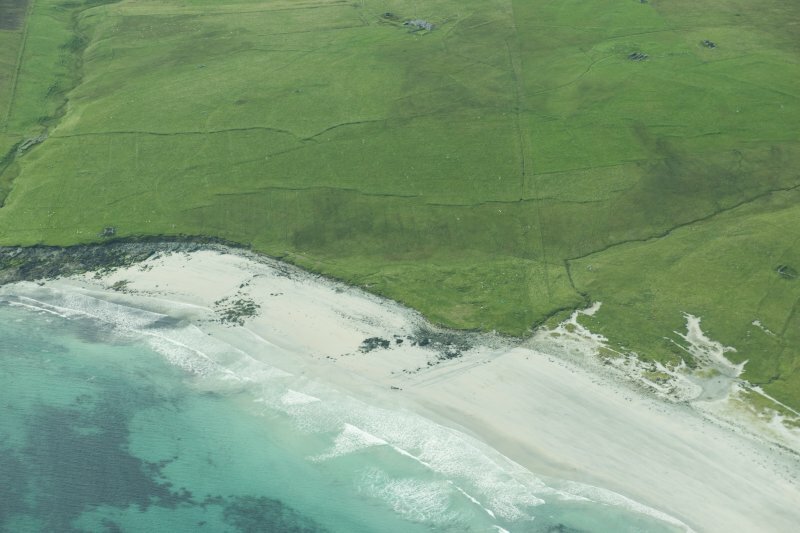 Oblique aerial view of Sandwick, Unst, looking SSW. 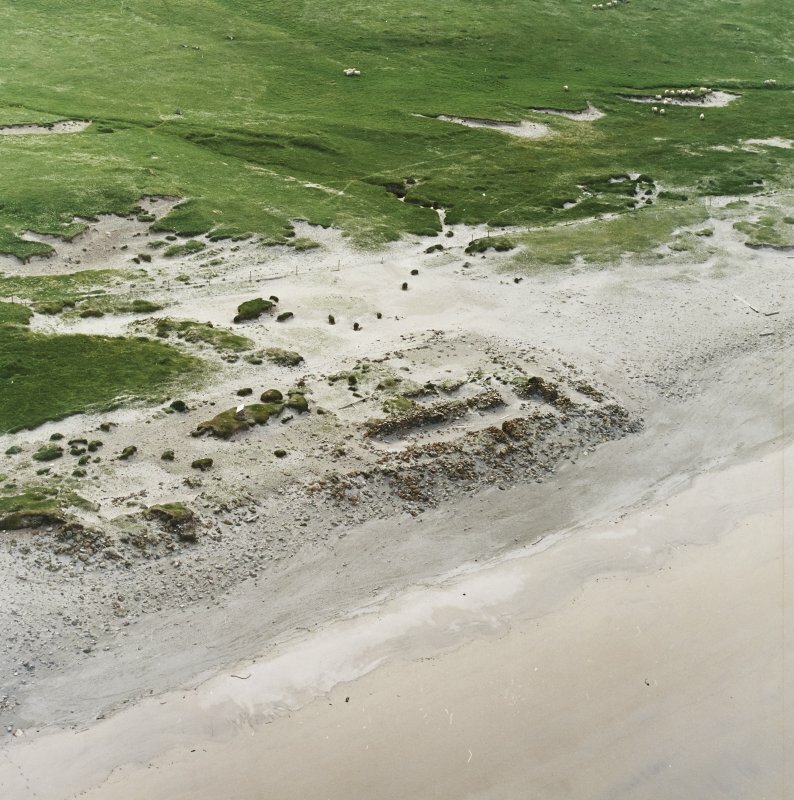 Oblique aerial view of Sandwick, Unst, looking NW. 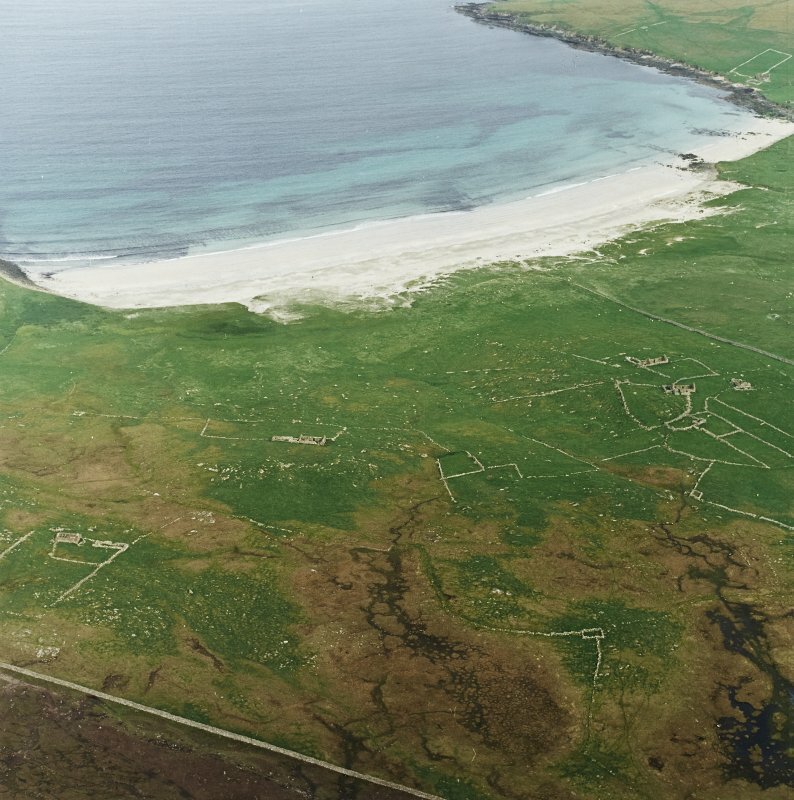 Oblique aerial view centred on the remains of the Viking Settlement, taken from the W.
Oblique aerial view centred on the remains of the Viking Settlement, taken from the NW. 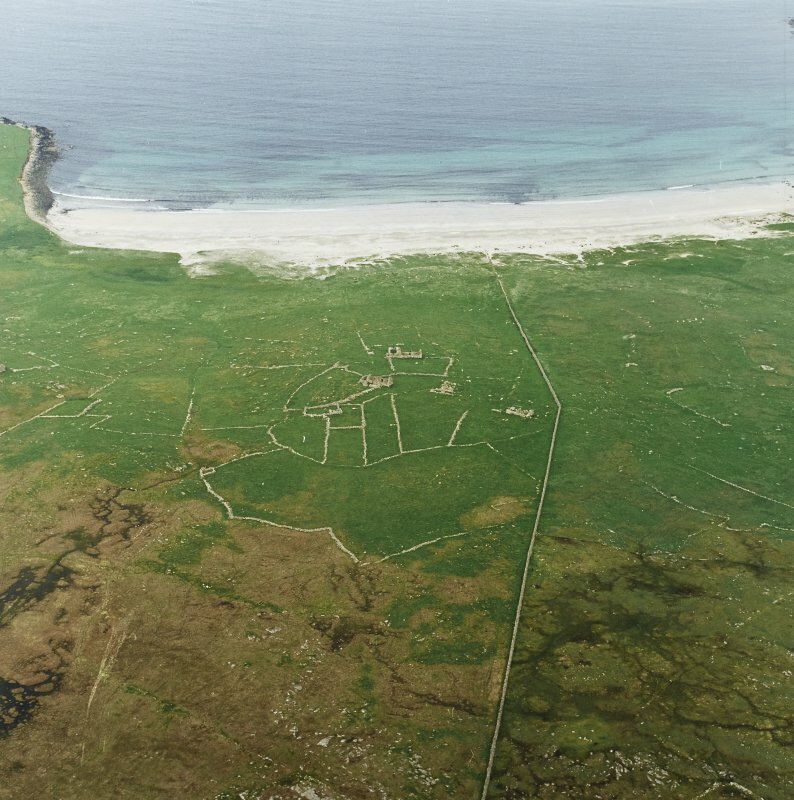 Oblique aerial view centred on the remains of the township and head-dyke, with the remains of the Viking settlement adjacent, taken from the WSW. 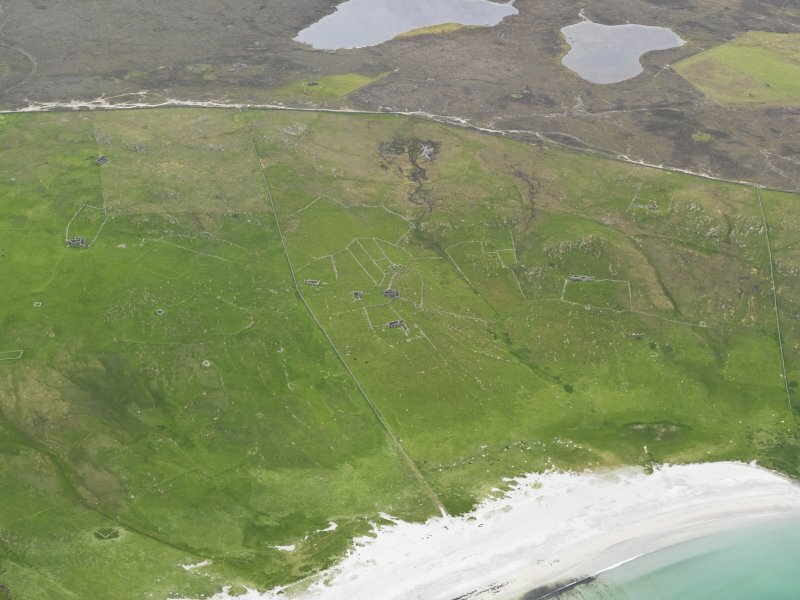 Oblique aerial view centred on the remains of the Viking settlement, taken from the E.
General oblique aerial view centred on the remains of the township, head-dyke and Viking settlement, taken from the ENE. 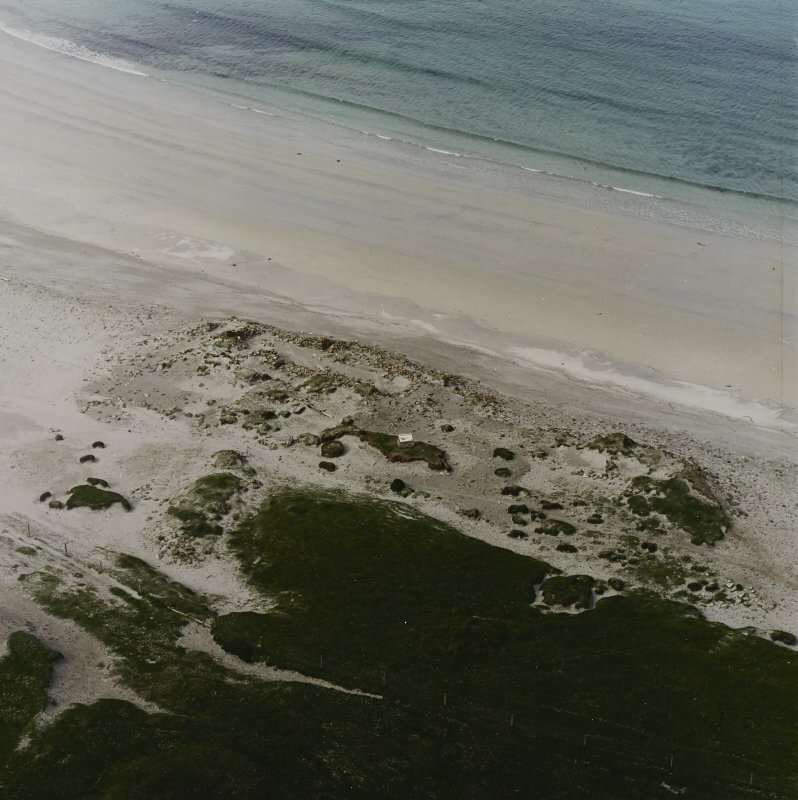 Scanned image of oblique aerial view centred on the remains of the Viking Settlement, taken from the SW.
Oblique aerial view centred on the remains of the township and head-dyke, with the remains of the Viking settlement adjacent, taken from the NW. 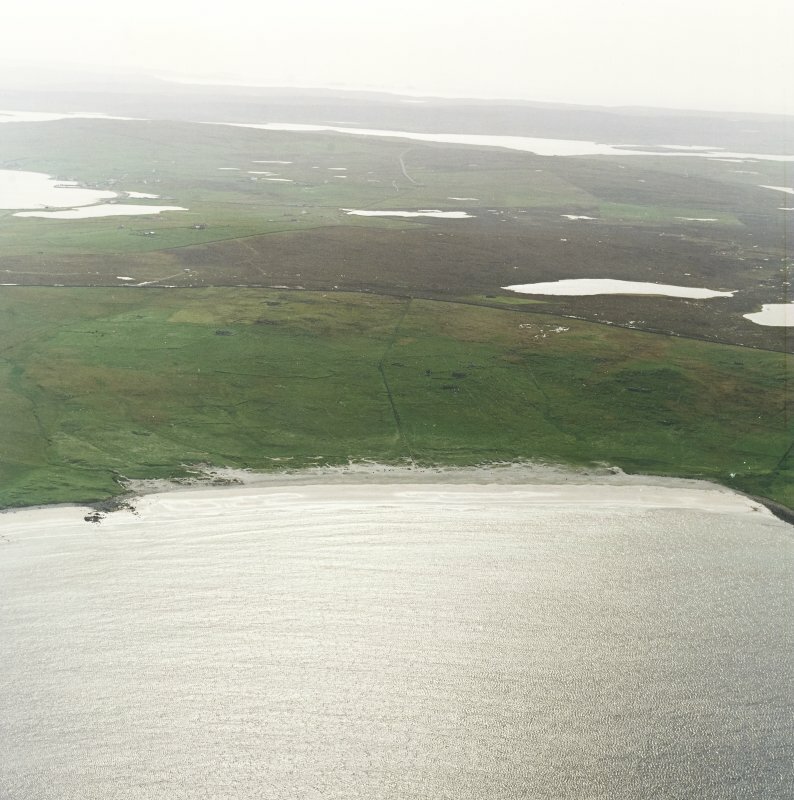 General oblique aerial view centred on the remains of the township, head-dyke and Viking settlement, taken from the NE. 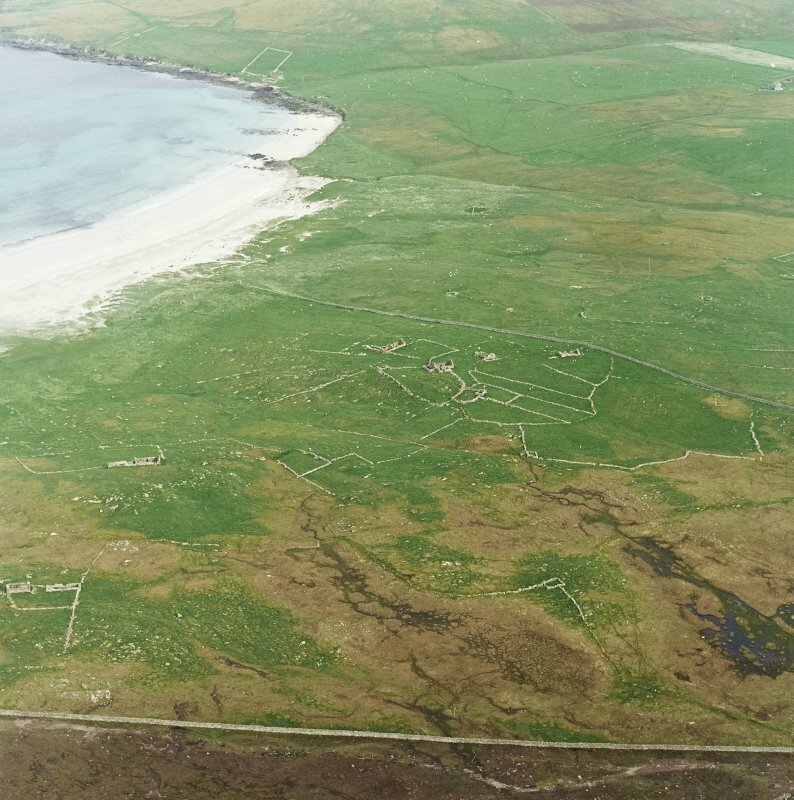 Oblique aerial view centred on the remains of the Viking Settlement, taken from the SW.
Oblique aerial view of the buildings and field systems at Sandwick, looking W.
HP 619 023. 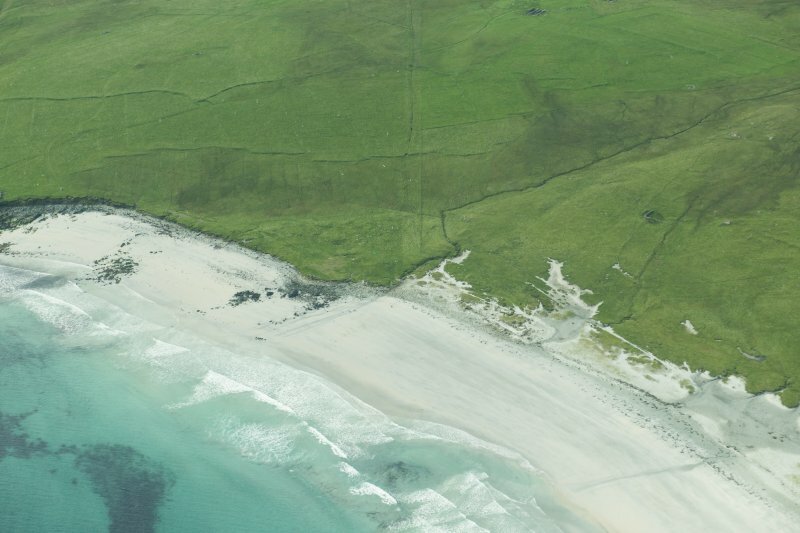 Norse house, Sands of Sandwick. It is a mere foundation 50' to 60' long with an interior width of about 11'. There are traces of outbuildings. (Possibly associated with HP60SW 12 - kitchen-midden). A Viking bone comb (ARC 65493) found in 1960 by W R Jamieson, Muness, an iron hand axe (ARC 6616) dated to 1000 AD by Historisk Museum, Universitet Bergen, and a Viking comb (ARC 6617) found by Dr R Saunders in 1965, at Sandwick, Unst, are in the Shetland Museum. The alleged Norse house is at HP 6186 0226. 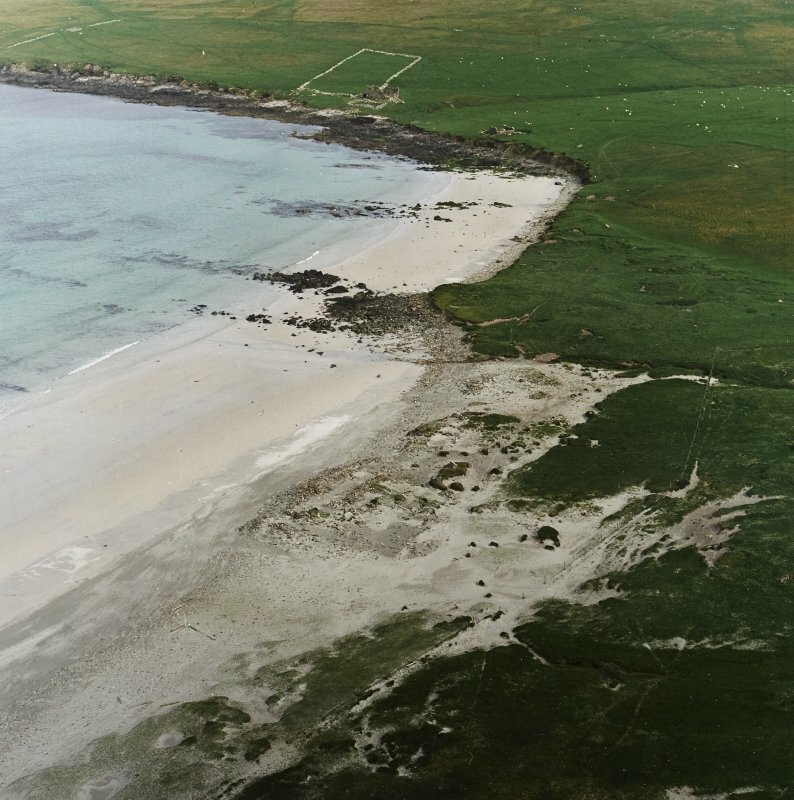 It occupies the crown of a stony knoll on the beach and is defined by drystone walls 0.6m maximum height, c.1.6m probable width. It measures 16.0m by about 3.5m internally. The E. wall is completely covered by a pile of debris. 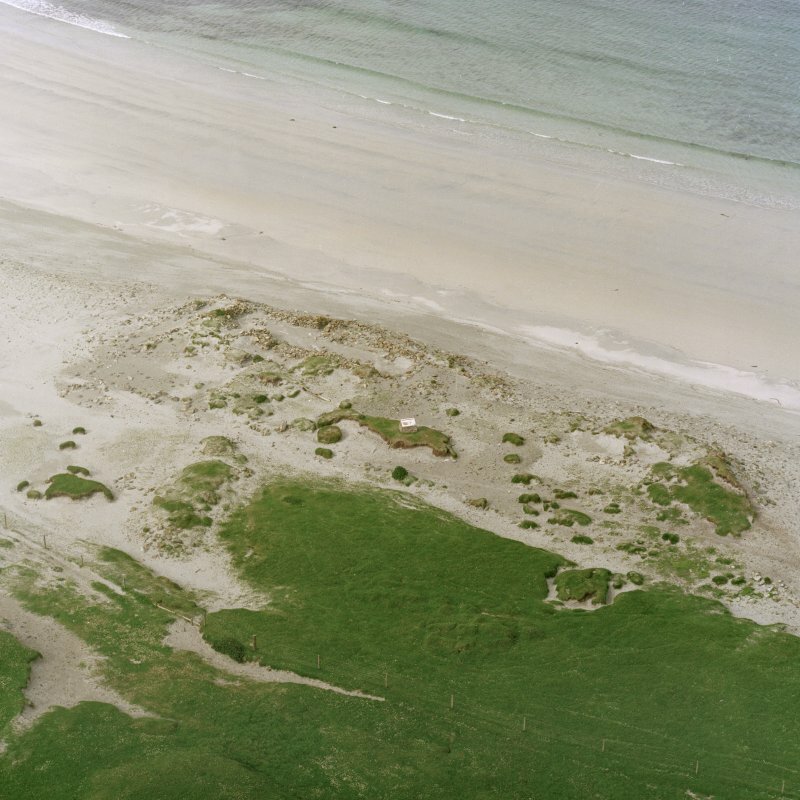 There are traces of annexes and enclosure walls, and c.60.0m to the SE are the amorphous remains of what has probably been an associated building apparently measuring about 6.5m by 3.5m in which midden material can be seen. 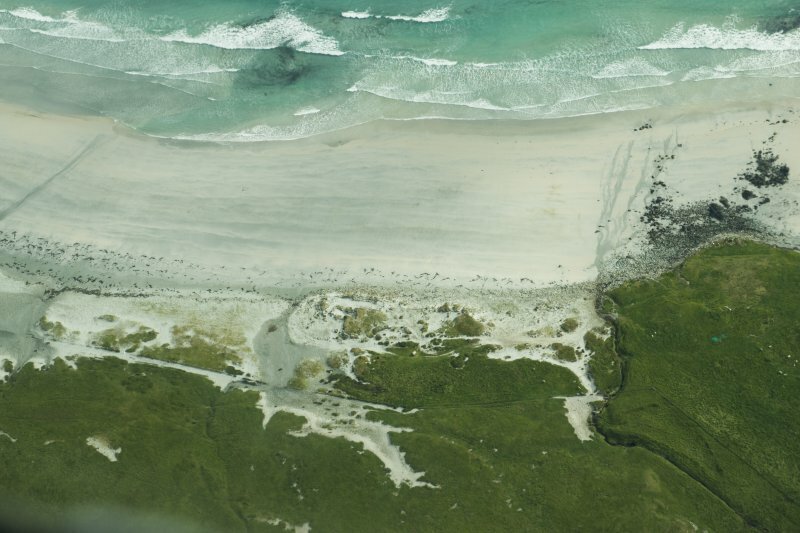 Mr Jamieson indicated approximately where the comb was found in an area of sand dunes at Sandwick Links (HP 618 023). He could not remember the exact find spot. 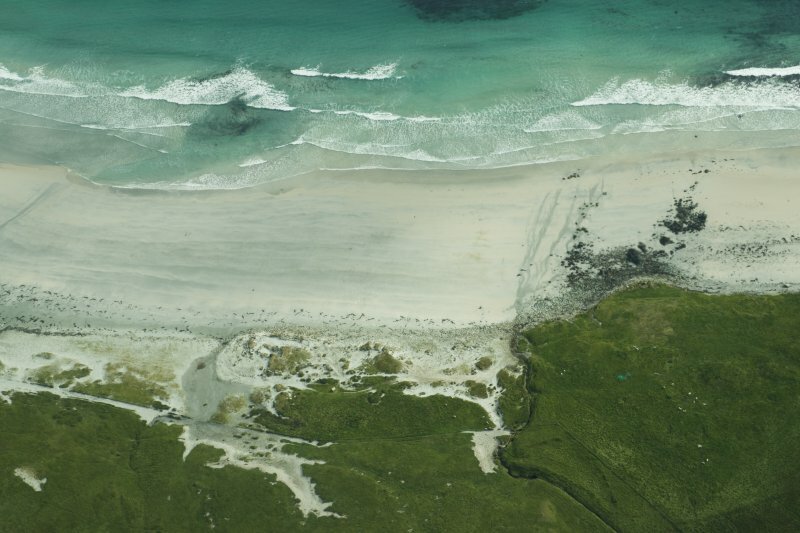 According to Mr Henderson (T Henderson, Curator, Shetland Museum) who received the information from Dr Saunders (a summer visitor) the other comb and the axe came from approx. 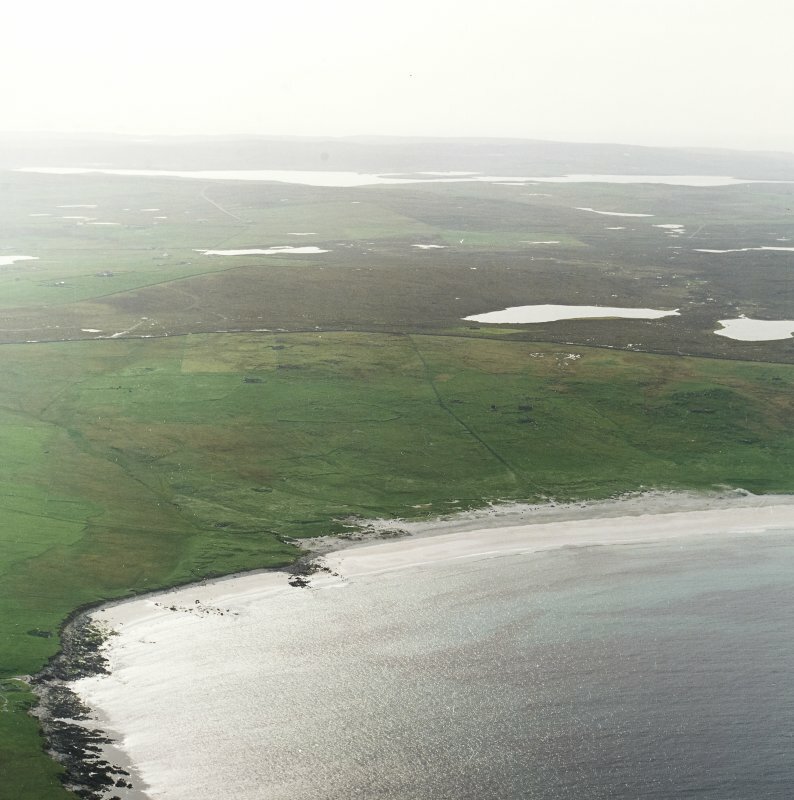 HP 6185 0224, to the SW of the Norse house. 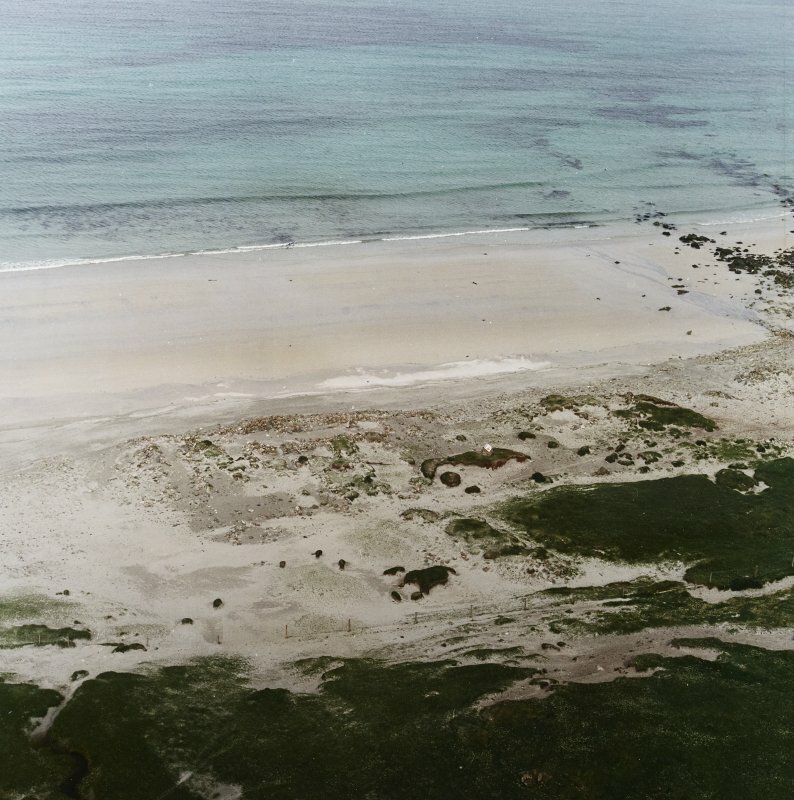 Local tradition asserts that there was once a church in this locality, but this is probably due to the discovery of several crouched inhumations in the area centred HP 618 022, many years ago (R Niven Spence, Uyeasound) of which there is now no trace. Visited by OS (AA), 7 May 1969. 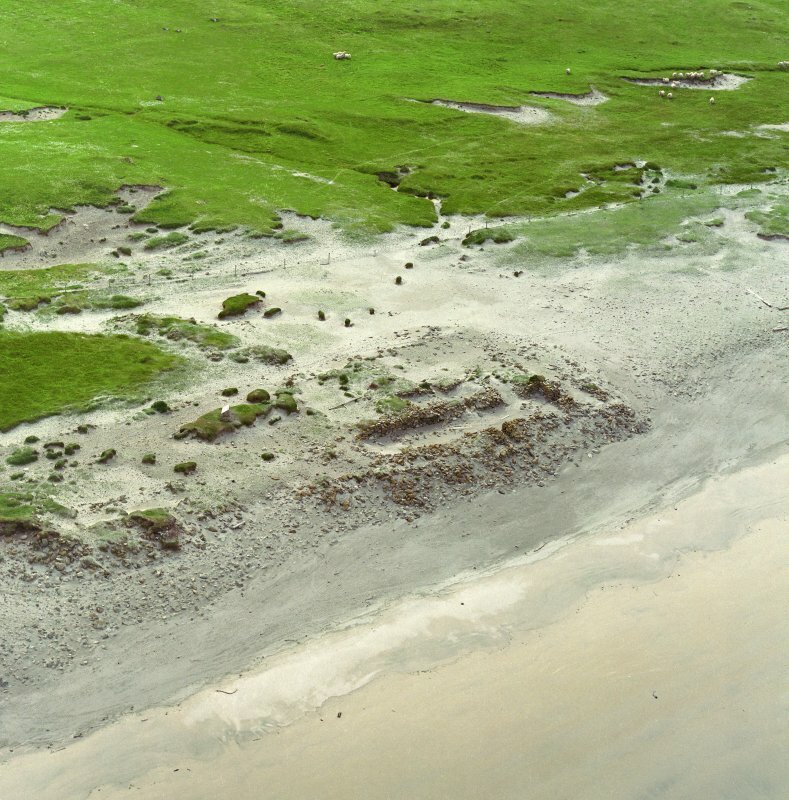 Excavations of a longhouse and associated yard at Sandwick by G Bigelow. G F Bigelow 1978; 1979; 1980.